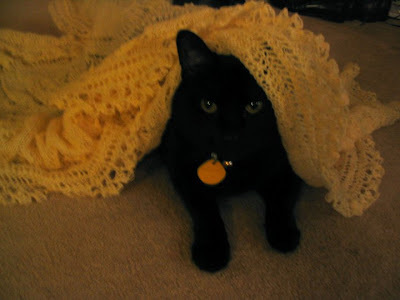 Moonbeam: pi shawl - my first lace knitting project! pi shawl - my first lace knitting project! Amazingly, I decided to do this at Thanksgiving and had it done a week before Christmas. Yes! 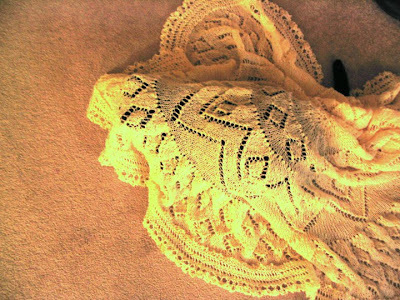 This is Elizabeth Zimmermann's Pi Shawl from the Knitter's Almanac. I have wanted to try this for years now, and I was prompted to finally do it when I found a cone of 100% virgin wool at a local thrift store - for fifty cents!!! With lace I don't know how much the needle size matters. I did not use her recommendation (which is always loose anyway), I just used what I had on hand - number 5 (?) circular needles. The following picture was taken just after a great deal of cursing and perhaps a couple of tears. I dropped a stitch and kept going without knowing it (curse you lace!!) only to discover the error when the diamonds were not lining up. Yes. I had to examine every stitch in a 200+ stitch area to discover this issue. I really really thought about trying to cover it up. But taking the high and painful road I decided the frogging was the best course. And Pipsqueak was there to comfort me. And to try and play with my fragile frogged lace. This is when I finally started on the lace edging - that was exciting! Incidentally the rest of the project was error free. Wowzers. 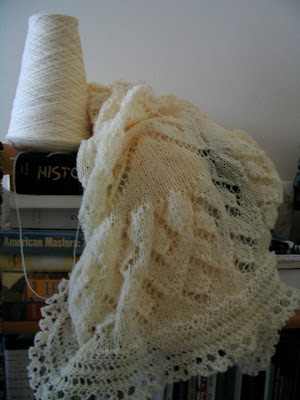 I really liked it all ruffly and unblocked. 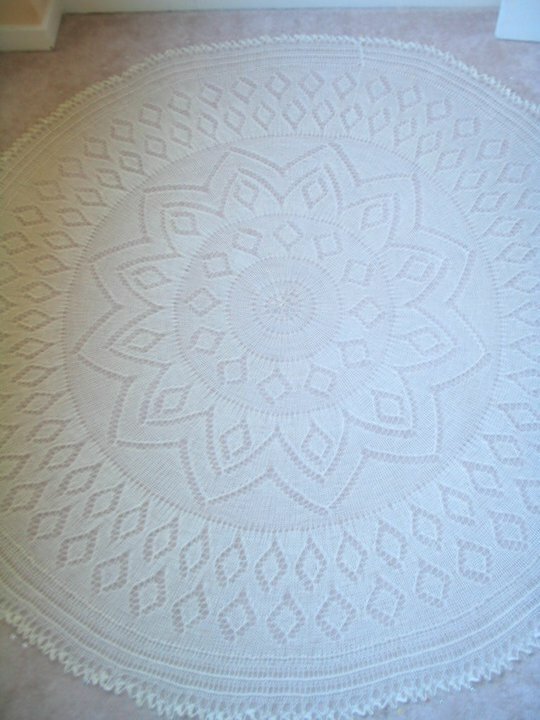 I was almost tempted to leave it like that :( I am glad I blocked it though since it was a super special gift for my mum-in-law. And holy schmanoly did I have to use a bunch of pins. I literally had to use every pin I owned - even had to take some out of projects I was working on. See how preeeetty? I was so pleased with how this came out. The wool was a bit rough and scratchy, plus I'm sure it had a germ or two from the thrift store (the store WAS called the litter box). I googled how to soften wool and found a neat tip - right after washing it with woolite, soak it in hair conditioner dissolved in water! I would not have thought this up on my own, but it actually does make sense - and it works! I used a lot of conditioner though - I could definitely tell a difference, but it doesn't turn it into merino wool or anything. 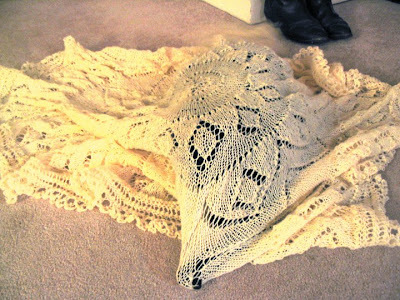 I would totally do this project again...with a tad bit more caution knowing how invisible dropped stitches are in lace. And here is the happy recipient modeling it at Christmas! We were at the Bilmore House and it was freezing. This certainly came in handy, and someone even commented how nice it was! Next I need to show you the other last minute knitted gift I made for Craig - I whipped up a hat that I had wanted to knit for a long time...turns out it was just the right gift because he had forgotten his normal hat and was panicking. It really was freezing! That is a beautiful house though - if you have a chance to see it I do recommend it. holy crapoli! You did this by hand!!! This is awesome! Pipsqueak is adorable! Cats do love any new item they can take possession of- heh heh ...and great tip about hair conditioner... though, yep, it does make sense, since after all wool is just sheep's hair- I actually use hair conditioner on my paint brushes, will use it on sweaters now! OH my gosh!!!! You are amazing! This is stunningly beautiful, and I am so impressed you finished before Christmas! You must have bin a knitting animal! OH MY GAWD! u are by far the most talented person I know!